Aircraft in Squadron 6 pcs. 20 mm Oerlikon Mk2015 х 2 pcs. 40 mm Bofors Mk111 х 2 pcs. Saipan — American promo premium Tier VIII aircraft сarrier. A high-speed light aircraft carrier based on the Baltimore-class cruiser. Despite relatively small dimensions, the ship carried a rather powerful air group and was armed with numerous AA artillery. She boasted very good armor comparable with the protection of far larger attack aircraft carriers. Saipan was first released for sale on 12 April 2016 for the NA server and 13 April 2016 for the EU server. As a premium USN aircraft carrier, Saipan’s uniqueness comes from her aircraft being very similar to Midway’s in speed, survivability, and armament count per plane. Additionally, the ship itself has much better concealment and rudder shift than her USN peers Lexington and Midway, allowing players to move faster to their desired location and stealthily closer to their strike targets. This gives players an edge over their same tier counterparts in faster and quicker strikes to whittle down the enemy. However, she does not have the same attack flight size and squadron size of Midway’s nor does she have Lexington’s armor. The lack of armor means that enemy battleship salvos and torpedoes will cause much more damage to the ship when the player is detected. Players must be careful of where to position their ship for maximizing their strike capabilities while keeping their ship intact. Furthermore, while Saipan’s torpedo bombers do carry two torpedoes each like Midway’s, this amplifies the effect of lost damage output for each plane shot down by the enemy. Furthermore, her aircraft restoration time is the longest out of all carriers currently, making each aircraft lost a massive decrease in her constant damage output. Players should carefully select targets, as randomly lashing out at any target that will have a formidable anti-air defense will result in a complete exhaust of available strike aircraft. The culmination of these characteristics allows Saipan to have higher overall potential damage output with most other same tier carriers. Players should attempt to use each squadron as effectively as possible through minimizing losses and getting the most damage in each attack run. As a premium ship, Saipan does not have any upgrades to research. 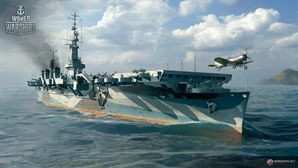 As Saipan is an aircraft carrier, players cannot modify for premium consumable versions and has standard aircraft consumables for a Tier VIII carrier. As a premium ship, Saipan comes included with Type 10 camouflage that lowers her detection radius, reduces the accuracy of incoming shells, reduces the cost of the ship's post-battle service, and increases the amount of experience she earns. As a carrier, Saipan has no risk of detonating and a very fast fire extinguishing time. Players should mount Equal Speed Charlie London ( ) for increased XP gain per battle, Zulu Hotel ( ) to help increase the speed of commander (re)training, Juliet Yankee Bissotwo ( ) for faster flooding recovery time, and Juliet Whiskey Unaone ( ) to have a better chance at causing flooding to enemy ships. Players can also choose to equip the Dragon Flag ( ) for faster commander (re)training for the other carrier that the captain is trained on. The first USS Saipan (CVL-48) was a light aircraft carrier of the United States Navy, the lead ship of her class of carrier. She was later selected for conversion into a command ship in 1963–1964, but instead of becoming a command ship she was converted to the Major Communications Relay Ship Arlington (AGMR-2) in 1965. Saipan was laid down on 10 July 1944 by the New York Shipbuilding Corporation, Camden, New Jersey; launched on 8 July 1945, sponsored by Mrs. John W. McCormack; and commissioned on 14 July 1946, Capt. John G. Crommelin in command. The Douglas AD "Skyraider" is a single-seat aircraft. It has no rear gunner. Only 26 Douglas BTD-1 Destroyers were built and none saw combat. F4U Corsair and Douglas AD "Skyraider" are missing. USS Saipan underway, circa 1956. FH-1 Phantom of VF-17A on Saipan, May 1948. Cadets touring Saipan, docked in Pensacola, Florida, 1956. Aviation Officer Candidate in pre-flight training aboard ship, 1956. This page was last modified on 15 April 2019, at 14:37. This page has been accessed 86,332 times.